The VDV itself keeps saying it wants the BMD-4M, and I think I trust Shamanov more in this case than the Army Generals. The vehicle is available, in just 2 years they could easily buy ~150 units, and in that way massively increase VDV brigade potential within short order. I agree. The units can't simply go into limbo... they need to be equipped and ready to do their job. Another aspect I forgot is production... having a 2-3 year gap in production is not good for the makers either. I rather suspect that the best solution is to adopt the BMD-4M as the parachute drop standard vehicle for the VDV and buy them for the parachute units. The other units can get upgrades of their BMD-2s like the Berezhok turret upgrade and new communications and sensors and electronics to enable a net centric capability with new navigation and night vision equipment to allow them to train as an all weather day/night fighting force. In 3-4 years time when the new vehicles are introduced they could get the electronics and weapons of the new vehicles retrofitted to their BMD-4Ms with perhaps armour and NERA and APS additions as well for the parachuting units and Kurganets-25 for the air mobile units. The unified electronics should simplify things too. Interview with CEO of the Military-Industrial Company Dmitry Galkin. Cenaturo and Frecia in Russia! What is the commonality achieved between current BMP-3 and BTR-80/82 APC ? Also it was mentioned that Kurganets will end up having 45/57 mm Gun which when compared to BMP-3 100 mm Gun is a downgrade but then I think the requirenments are not similar they are aiming for guided rounds in anti-aircraft role , so achieving a standardisation might be a priority over firepower. The Kurganets and 25 ton class boomerang are going to be similar weights, so it makes sense to give them similar engine packs. Armament and electronics/sensors will likely be the same too. Other than that screens and seats and controls can be standardised, with the seats designed to reduce the damage under floor mines do to the crew and passengers. Different weight classes and roles... one is an IFV and the other is an APC. With Kurgan and Boomerang both are IFVs and APCs and tanks and everything else... and they are in the same weight class (ie medium) so it makes sense to have common engine and transmission... different running gear of course because they are tracked and wheeled, but in terms of weapon systems and electronics and sensors they can use the same stuff. Good for logistics and training and purchasing economics. The primary role of the main gun on the BMP-3 is to penetrate enemy IFVs... the 30mm gun no longer cuts it, and using 100mm guided missiles is expensive and they are for emergency use against tanks anyway... they only have 8. With a 45/57mm gun they should manage a decent HE charge that is rather more than any 30mm cannon, though it wont be as powerful as a 100mm rifled gun. The armour piercing round for the 45/57mm gun will be able to defeat any non tank IFV from any angle out to 2,000m and with guided shells could perhaps even deal with helicopters and air targets out to as far as they can see them... 6-8km. In other words not as good at HE as the 100mm, but still a useful HE shell, plus much better penetration and anti air capability than the 30mm gun. 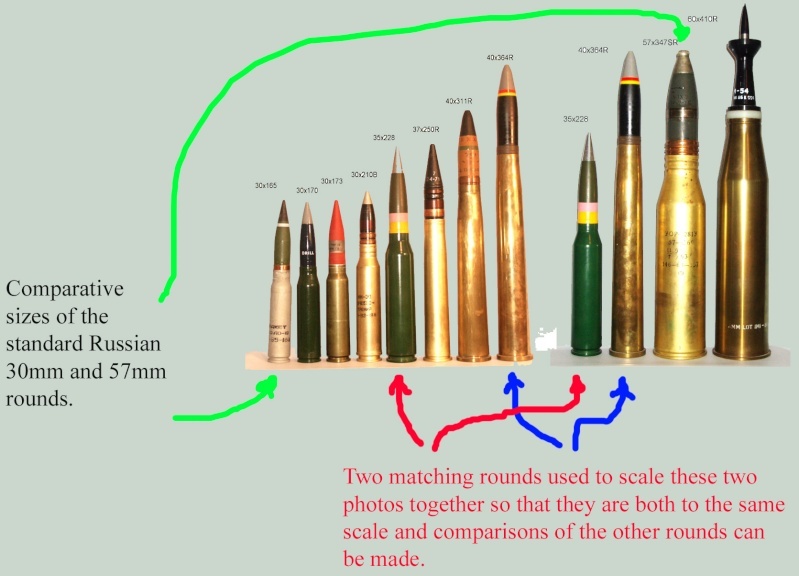 That is not a bad compromise... especially when you keep in mind that several vehicles in the Brigade will have 120mm gun mortars with an even more powerful HE shell than the 100mm rifled weapons on the BMP-3, and heavy guided missiles as well. The standard pattern was BMP-1 with 73mm gun and BTR-60s with 14.5mm HMG. Then they introduced the BMP-2 with a 30mm cannon, but it did not replace the BMP-1 because they found the extra HE power of the 73mm gun complimented the 30mm cannon rather than the cannon replacing the 73mm weapon, so they used the 73mm gun with the 30mm cannon and 14.5mm HMG. With the BMP-3 they replaced the 73mm gun with a 100mm rifled gun and kept the 30mm cannon with new ammo, and they added the BTR-80A with a 30mm cannon and the BTR-80 with the 14.5mm HMG. I rather suspect that we will see in the new brigades vehicles with 45/57mm guns in the IFV role, but we will also see basic troop carriers (ie APCs or BTRs) with a 30mm cannon or a 14.5mm HMG. I also suspect to make up for the direct fire HE that is lost with the BMP-3 they will compensate with 120mm rifled gun armed BMPT type vehicles, which together with 120mm Vena type vehicles (similar to the BMPT but without the extra gatling guns and grenade launchers... perhaps with one rifle calibre RWS and more 120mm ammo) which operates as a support vehicle for the unit. The main difference between the two vehicles apart from the extra armament on the BMPT, is that the Vena type vehicle will mostly fire indirectly at targets it can't see directly, whereas the BMPT will be used as an anti ambush weapon for convoys and tank units... taking on Javelin launch teams and RPG teams whereever they hide... in trees, up cliffs, in tall buildings, etc. This way they get both standardisation AND firepower. Nice Post Garry , Thanks. With a bigger gun I think widespread deployment of APFSD rounds on APCs and IFVs will happen as well. The new telescoped case rounds seem to be based on APFSDS rounds with nose pulling sabots for the penetrators. I would expect the rather larger HE shells will take up more internal space, but they will need far less propellent to do their job so that doesn't matter so much. Though nothing of course about the new 45mm rounds the Russians are developing, though it does mention the 57mm upgrade of the PT-76 that is in competition with the new 45mm round. Yes GarryB telescoped ammunitions will ,very likely, represent more and more the great majority of next decade IFV's armament. What is very important to point out is that the great spare is space offered by telescoped ammunitions will allow to equip IFVs with rounds of greater caliber, by now critically important for successful penetration of the most advanced opposing IFVs and to neutralize defiladed/open-space infantry with vastly inferior number of rounds and in much less time, retaining a very good amunition reserve for battlefield persistence. Those two PDF directly from CTA International can aid to realize with greter precision what now said. Personal note : at pag 13 of the first and pag 7 of the second anyone can see why ,in the latest years, we observe this quick trend toward 35mm and 40mm guns in western IFVs : anyone ,behind closed doors is perfectly aware that domestic version of BMP-3/3M is highly resilient to 30mm rounds in the frontal projection . The last point to touch for Russian perspective rounds, is that the greater volume offered by 45mm and 57mm ammunitions will allow to employ ,in specialized rounds , special fuse, aerodynamic actuators and guidance sensor to achieve fearsome PK against practically any flying targets (from reconnaisance UAVs to PGM ...) at altitudes up to 6-7 km ; in a new completely integrated battlespace with third party target detection/guidance/designation this will allow to effectively realize a real revolution in modern ground warfare. Ive always liked the idea of an IFV armed with a high pressure 76-85mm gun. Would make it have a decent HE power and actually have anti armor performance unlike a low velocity 100mm HE chucker. Of course the gun barrel would be too narrow for a gun launched ATGM but since the bastion ATGM is hardly decent( only 650mm after ERA thats hardly enough to penetrate a leopard 2A6 or challenger 2) why not just mount a kornet-EM launcher on the roof? Ive always liked the idea of an IFV armed with a high pressure 76-85mm gun. The problem there is that a 76-85mm high pressure gun has an enormous propellent case and therefore a decent load of ammo would fill the vehicle leaving no space for troops... which is kinda the whole purpose of an IFV. Even the 57mm gun mentioned has a huge case which dramatically reduces the number of ready to fire ammo it can carry at any one time. The PT_76 is a very large vehicle and can carry about 70 rounds of ammo... if you want to carry troops too you would need to reduce the ammo load to maybe 30 rounds which is obviously a problem when the gun spits them out at 2-3 per second. Would make it have a decent HE power and actually have anti armor performance unlike a low velocity 100mm HE chucker. You are forgetting we are talking about a troop transport, not a tank killer. The ATGM capability of the BMP series is for defence only. Its other anti armour capability is to engage its equivalent in the enemy forces and any other fire power it might have (MGs and HE) is to support its squad of infantry. In the 1980s the combination of 30mm cannon which was effective against enemy IFVs and APCs and aircraft, along with a 100mm low velocity HE capability against bunkers and enemy firing positions was ideal. Now that IFVs are 30-40 tons then it is not good enough... well the 30mm cannon is not good enough, the 100mm is still fine. The thing is that a more powerful anti armour gun for use against IFVs is increasing in calibre to the point where it can be fitted with a decent HE capability so the 100mm gun is becoming redundant. With the removal of the 100mm gun they can carry rather more ammo for the 45/57mm gun, yet still retain decent HE capability. Of course the gun barrel would be too narrow for a gun launched ATGM but since the bastion ATGM is hardly decent( only 650mm after ERA thats hardly enough to penetrate a leopard 2A6 or challenger 2) why not just mount a kornet-EM launcher on the roof? As you can see that while a BMP could carry 500 30mm cannon shells it is not going to be able to carry anywhere near that in 57mm shells, and even in terms of ammo handling it will be a pain inside an IFV. Telescoped case rounds are much more compact and easy to handle in comparison yet offer similar performance to the much larger ammo rounds. Here's the 57x347SR in use on a ZSU-57-2, the vehicle carries 300 rounds, though I doubt an IFV can carry anywhere near that number. It makes the 30mm look like a popgun by comparison. KomissarBojanchev here we talk of IFVs , vehicles that ,in a modern battlefield, are supposed to be employed in manoeuvring offensive and defensive operations (...or, for those capable of the crucial amphibious motion's capabilities, also in circumvention's operations to destroy enemy rear guard, logistic assets or to cut away whole sectors of enemy offesive front) under heavy fire of enemy infantry's 5,56mm ,7,62mm, 12,7 mm authomatic weapons and several type grenade lauchers and casual fire from enemy IFV's 20mm, 25mm and 30mm autocannons some of which with airbust capabilities. Gun launched missiles are therefore ,for a vehicles designed for a full scale war scenario, dozen of times more efficient and capable to retain its capabilities to engage from stand of range enemy vehicles and fortifications even under enemy authomatic weapons fire and among near explosions of enemy mortar rounds, artillery rounds and air burst munitions . Someone could realize now why vehicles designed to operate in similar open-battlefield high intensity war conditions ,such as 9M123 Khrizantema or even modern Kornet-EM vehicles, use this complex sealed internal storage system for theirs missiles instead to simply carry them over the roof. How you well know today the ATGM used in BMP-3/BMP-3M is 9M117M1 "Arkan" ,with range in excess of 5,5 km vastly incresed speed, much superior capability to engage helicopters and slow flying UAVs and tandem warhead with penetration capability of 750mm after ERA ; moreover i image that you are aware that similar ATGMs since Soviets times was foreseen to be used against western tanks in pairs, delivered by IFVs/MBTs placed at relative angle ,in respect to enemy MBT's axis , of 40 degrees or more ,so to assure that at least one of thew two ATGms would have hit side of aimed enemy tank. Anyway this is a small article describing its expected anti-tanks performances. Latest Russian developments in high efficiency guided ammunitions for medium calibre weapons (57 mm with dual interception modes) for use in LAV and perspective antiaircraft/UAV/PGM vehicles on former and unified platforms. All those very high costly offensive weapons, cause theirs overall low speed , highly predictable trajectory and almost absent capability to manoeuvre, will represent very trivial targets for any vehicles in Army formation equipped with similar guided medium calibre weapons , offering also wide margins for re- engagement of any offensive element eventually surviving the first interception; the economy of those engagements will definitely favour the defender. the 2nd what has in its tower? There is a mini model (something like a toy) on the second photo. It seems on the vehicle in bottom picture it have small unmanned robot vehicle with machine gun. Maybe it is kind of recce vehicle or platform for UAVs and robots. Yeah I was wondering WTF that weird thing was is. Is it a turret? Is it a sensor? No, it's a mobile robot with a machine-gun! But seriously that just sounds too ridiculous to be true. If it's a mobile, armed robot then what is it doing on top of the vehicle? As for the main turret - my first guess would be some kind of small-caliber mortar, maybe 82mm. But it's probably something else, not necessarily a weapon. The robot model was simply placed on top of Boomerang. The box it's sitting on is directly over the engine compartment. Basically, it's there to show that version of Boomerang serves as a command hub for unmanned vehicles. I'm not exactly sure what the turret is though. My guess would be the armored cover for a boom mounted sensor suite. It looks like they cut away the side of the armor on the turret model so the sensors are visible. I'm very impressed by the amount of static and panoramic cameras placed around the vehicles, especially the IFV version. Project modular armored personnel carriers (APCs). Developing modular BTR "Boomerang" on the basis of high wheel unified platform commissioned by the Ministry of Defense of Russia instead of BTR-90 as of mid-2011 is Rezrabotka military-industrial companies with Arzamas Engineering Plant. According to media reports in November 2011 BTR project has already been approved. 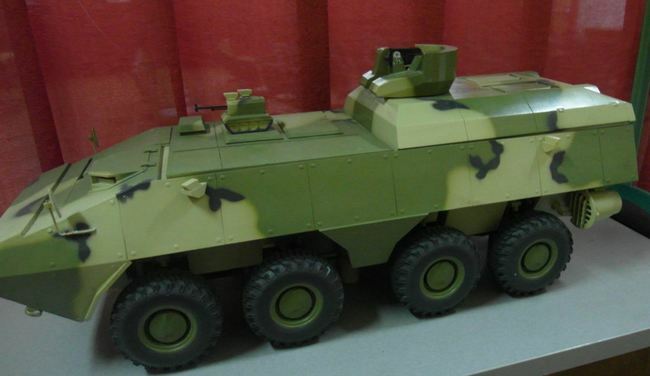 Based on the new APC by replacing modules planned for SAM launcher, reconnaissance vehicle, ambulance, car ATRA and BMP in the wheel version. At the beginning of 2011 in a press release stated that the development of a prototype to be completed by 2015, but it was 21/02/2012 Commander Land Forces of Russia said that the first samples will go to the troops in 2013 and the massive supply will begin in 2015, 11 October 2012 in the media podyavilas supporting information - the first two samples on APC universal platform "Boomerang" will be presented to the customer in 2013 In 2015, it is planned to start production and platforms and APCs in particular. Could be, that this turret is protection for unmanned vehicles guidance system, which could be also placed on elevating arm and have to rotate 360°. Equipped with UAV like Orlan-10 and ground robot could be part of recce battalion and could work from distance in more dangerous sectors.